A man fatally injured when a brawl broke out at a town hall boxing match died from a neck wound, said police who have made a second arrest. Reagan Asbury, 19, was attacked on Sunday night when disorder at Walsall Town Hall spilled on to the street. A 22-year-old man was arrested on Tuesday on suspicion of assisting an offender and followed a 25-year-old man's arrest on Sunday on suspicion of the same offence. That man has been released on bail. Both were arrested at addresses in Derby. Police said a post-mortem examination carried out on Monday confirmed Mr Asbury, from Pelsall, near Walsall, died from a wound to his neck and further examinations would be completed. He is believed to have been stabbed. 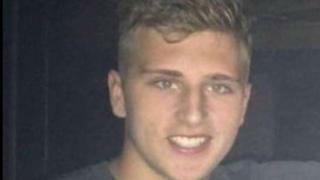 A tribute released by police and issued on behalf of Mr Asbury's parents said: "Our number one son, brother, grandson, nephew, cousin and friend…taken in such a callous, inhumane way. "What a cruel, cruel world we live in, especially for all our children. We are all so empty." Walsall Town Hall was hosting an IBF Youth Lightweight title fight between Luke Paddock and Myron Mills. The bout was won by Myron Mills, from Derby, following a split decision. Det Insp Justin Spanner said West Midlands Police had spoken to several witnesses and secured CCTV in a bid to explain what sparked the disorder. He said there was a large crowd at the event and the force needed "to speak to as many of them as possible".